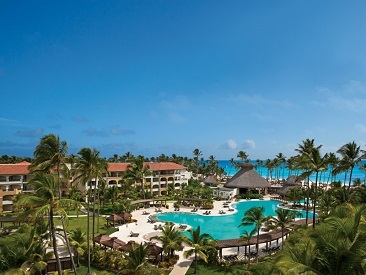 Now Larimar Punta Cana is an all-inclusive, family-friendly resort, located on an idyllic white-sand beach on Bavaro beach Punta Cana. Now Larimar offers all of the privileges of an Unlimited-Luxury® escape in a casually sophisticated setting. Catering to couples, friends and families, guests will appreciate the understated luxury and uniquely comfortable ambiance of Now Larimar. 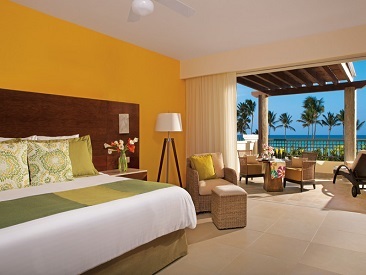 Savor every moment with deluxe accommodations, reservation-free gourmet restaurants, premium cocktails, pampering in the world-class spa, an on-site casino, endless daytime and nighttime activities and so much more when staying at Now Larimar Punta Cana. 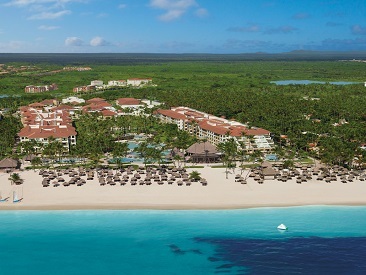 The Now Larimar Punta Cana is located on an idyllic white-sand beach, with amazing turquoise waters and tall, swaying palm trees in Playa Bávaro, just 30 minutes from the Punta Cana International Airport. The all-inclusive Now Larimar offers all of the privileges of an Unlimited-Luxury® escape in a casually sophisticated, family-friendly setting. Catering to couples, friends and families, guests will appreciate the understated luxury and uniquely comfortable lifestyle ambiance of Now Larimar. Savor every moment with deluxe accommodations, reservation-free gourmet restaurants, premium cocktails, pampering in the world-class spa, an on-site casino, endless daytime and nighttime activities and so much more. Where sophistication meets understated. And the kids have as much fun as the grown-ups. All 720 spacious guest rooms and ample suites feature impressive amenities, 24-hour room service, luxurious bedding and modern Caribbean-style decor, spread out in two 4-story buildings. Accommodations feature furnished balconies and truly impressive views. Indulgence beckons with the ultra abundant amenities of the Preferred Club suites which offer even more perks and privileges for guests to take advantage of. Guests who are not staying in the Preferred Club can add this service by upgrading to the Preferred Club. As part of the privileges of Unlimited-Luxury®, we’re offering guests of Now Larimar Punta Cana the chance to Sip, Savor & See participating sister properties in the region. Enjoy dinner and live entertainment at neighboring resorts including sipping complimentary cocktails, savoring delicious cuisine at the restaurant of your choice and the opportunity to see that evening’s entertainment. The Sip, Savor & See Dining Experience is only good for dinner. This is not a day pass. Guests must make arrangements through the resort concierge by 3pm. Guests may choose to dine at any of the restaurants that are serving dinner. Guests are responsible for cost of transportation to and from the resort. A maximum of 4 people are allowed per seating. Special restrictions may apply for Christmas and New Year’s Eve dinners and special events. Guests can utilize the facilities at the resort they are visiting from 6 pm to 1 am, including bars and theater. Sip, Savor & See may be limited due to private events and resort buyouts. With luxurious facilities and qualified personnel, couples will be guaranteed an unforgettable day, with a complimentary wedding package also available (certain restrictions apply). Now Garden Punta Cana is now part of Now Larimar Punta Cana.There are a total of 720 rooms, 12 restaurants and 12 bars, and the newly combined property will give guests the ultimate Unlimited-Luxury® escape.